Occupied Jerusalem: In a tight race for re-election, Israel’s prime minister has gotten a welcome lift from his friend in the White House. Benjamin Netanyahu’s campaign speeches, billboards and social media videos have all heavily featured President Donald Trump’s image, statements and pro-Israel actions as endorsements of the long-seated prime minister. Upon taking office two years ago, Trump quickly reversed course and established a tight relationship with Netanyahu. This has yielded benefits for Netanyahu on the campaign trail. In the run-up to Tuesday’s vote, Netanyahu has hosted Secretary of State Mike Pompeo, visited Trump in the White House and received American recognition of Israeli sovereignty over the Occupied Golan Heights, which Israel seized from Syria during the 1967 War. Those moves are seen as an unspoken US endorsement of Netanyahu, and in Israel, having close ties with whoever occupies the White House is seen as a major asset. Trump enjoys strong support among Israelis, 69 per cent of whom expressed confidence in the president’s ability “to do the right thing regarding world affairs,” according to a Pew Research Center poll published in October. That support largely springs from Trump’s recognition of Occupied Jerusalem as Israel’s capital and the opening of the US Embassy there. Trump’s withdrawal from the Iran nuclear deal and his decision to slash US aid to the Palestinians are also popular among Israelis. “Benjamin Netanyahu, there’s nobody like him,” Trump says in a clip taken from a 2013 video. 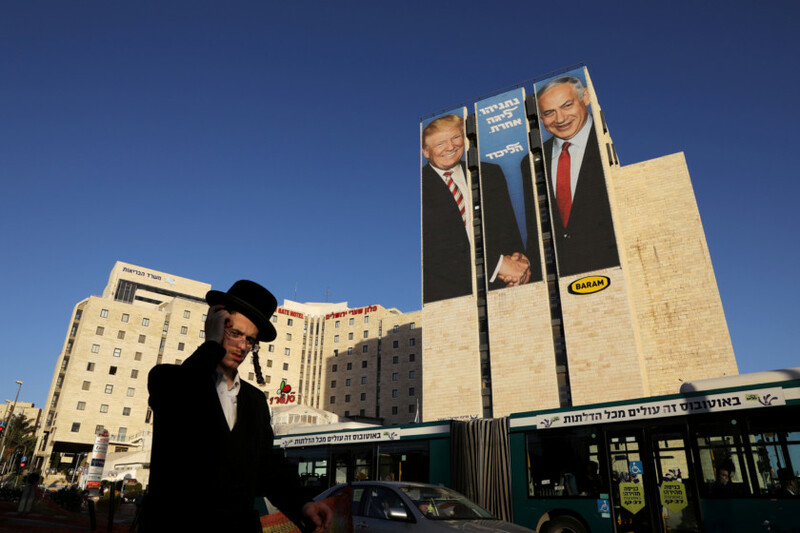 Building-sized billboards in Occupied Jerusalem and Tel Aviv show the two leaders shaking hands. A poll conducted by the Israel Democracy Institute found that 63 per cent of Israelis “believe that Netanyahu’s standing in the current election campaign will be strengthened by the US recognition” of the annexation of the Occupied Golan Heights. The survey interviewed 603 people and had a margin of error of 4.1 percentage points. The April 9 election is widely seen as a referendum on Netanyahu’s decade-long rule. Netanyahu seeks a fourth consecutive term in office as Israel’s leader. If re-elected, he will become the country’s longest serving prime minister, outstripping its founding father, David Ben Gurion. The prime minister’s campaign has steamed ahead despite Attorney General Avichai Mandelblit’s recommendation last month that Netanyahu be indicted for a series of corruption charges. With less than a week to go, opinion polls give Netanyahu a slight edge in the race. But he faces major opposition from his former army chief of staff, Benny Gantz.